Its animated brethren are already slumbering for the winter holidays, but The Simpsons refuses to call it quits just yet. And why should it? There's so much more ground to cover, so much more Springfield to tell. Or rather, there are so many more labored "celebrity" cameos to introduce, so much filler. Don't get me wrong: The episode was okay, just boring. For the first time this season, Burns is in the center of the action. He attends his annual billionaire retreat–a place where Quidditch is real–and wins control of the Celtics from the show's Texas oil tycoon in a poker game. He attends a game to get the lay of the land, and it's there he meets attention-hog Mark Cuban, a model for eccentrics everywhere. "What would Mark Cuban do?" Burns asks himself repeatedly for the remainder of the episode, resulting in a newfound desire to build a flashy new stadium for his team. Problem is, his plans directly impact Lisa Simpson, and for that matter the existence of all life. For you see, a bad case of bee measels is killing every bee in the world, and Lisa's new cause-of-the-week is to save them. So she dons a beard of immune bees and tries to repopulate the Earth with a new breed of stronger, more resistant bugs. Burns's stadium construction requires that the bee's greenhouse be torn down–but never fear because Homer, who will do anything to please his little girl (he says so himself), crossbreeds them with African toughguy bees. They go nuts and terrorize the fans at the basketball game, who go nuts and destroy the stadium. Ah, resolution. When I first saw that the episode was a Burns one, I hoped it would be singularly focused. One of my favorite episodes ever, "Rosebud," works marvelously as such, and it's not just because it's a brilliant Citizen Kane parody. 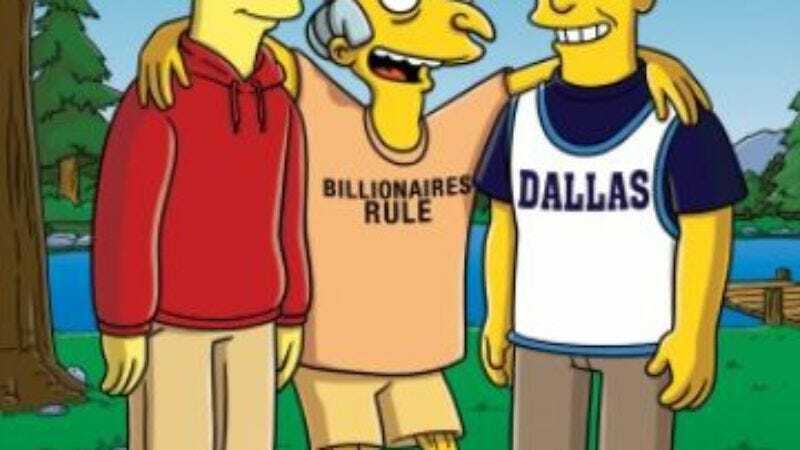 Of all the characters on the show, Burns has perhaps the richest backstory to draw from–he's a public figure way older than anyone should be, about whom not much is known. It's a recipe for great fun. But, sadly, "The Burns And The Bees" fell into the newish Simpsons trap.I feel like recent seasons of the show–for the most part–have tried to cram two major storylines into one already crammed episode. The effect isn't always great: The two meet only near the end, or not at all, and rarely does one elevate the other. Some of you disagree with me, but I really enjoyed this year's Halloween installment, in large part because it varied the typical episode format. It would be nice to see more experimentation, like the "However-many (sorry!) stories about Springfield" episode and, simply, a week that fleshes out one complex story. In the mean time, we got a spot-on WALL-E bit and some stellar throwaway lines: "He'll be gone sometimes, repairing refrigerators," "Once again, there is no child care at this meeting–I don't know who it was you gave your kids to," and the bold "We hate you most of all, Uncle Tom!"